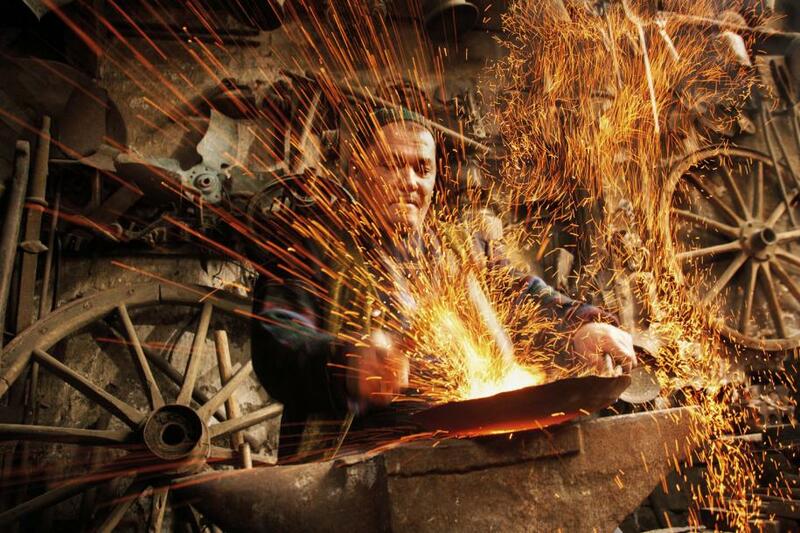 Azerbaijan, Shirvan, Ismayilli Region, Lahij, April 17, 2012 In his shop, a coppersmith heats and pounds copper to make a plate. Lahij is the old center for craftsmanship in Azerbaijan. Copper work has historically been the main source of income and the most popular profession in Lahij. In the mid-19th century, there were over 200 workshops in the village, which became the center of copper and arms production in the 18th and 19th centuries. Today, this remote mountain village of about 2,000 residents has preserved their traditional way of life as well as the Lahiji language that is only spoken. A philanthropist, idealist, humanist, and architect at heart and above all a famous photojournalist who has worked for The National Geographic among many other publications, Reza has been traveling the world for over 30 years, visiting more than a hundred countries, photographing conflicts, revolutions and human disasters. His eyewitness accounts have been published in the international media (National Geographic, Time Magazine, Stern, Newsweek, El Pais, Paris Match, Geo and more) as well as in books, exhibitions and documentaries by National Geographic Channel. More than just a photographer, Reza is a committed human being who has volunteered his services since 1983 to give an informal visual education to young people and women in vulnerable civil societies so they can help build a better world. In Afghanistan in 2001, he founded a next generation NGO Ainaworld, which trains people for careers in information and communication by developing educational tools and appropriate media. While pursuing his own reporting for international media, Reza has also provided training in different forms of visual language (both real and virtual) for refugees, suburban young people in Europe, and those living in insecure environments. After his Memoiries of Exile exhibition at the Carrousel du Louvre in 1998, he has shared his humanistic vision through monumental installations, including: Crossing Destinies on the railings of the Luxembourg Gardens in Paris, One World One Tribe in Washington DC and at the Parc de la Villette in Paris, War + Peace at the Caen Memorial and on the banks of the River Garonne in Toulouse, Hope in Doha (Qatar), Windows of the Soul in Corsica, and Souls of Coffee in 250 photographic exhibitions around the world, along with major installations on the banks of the Seine in Paris, and at Kew Garden in London. In 2013-2014, Land of Tolerance was shown at the United Nations in New York, the European Parliament in Brussels, and the UNESCO headquarters in Paris. In 2014, Reza's exhibition Azerbaijan, the Elegance of Fire presented in the Petit Palais in Paris, has assembled a selection of previously unpublished photographs to create a portrait of this land rich in ancestral cultures and with a contemporary society opening itself to the world. The author of twenty-nine books, a multiple prize-winner throughout his career, a Fellow of the National Geographic Society and Senior Fellow of the Ashoka Foundation, Reza was awarded the World Press Photo award, the Infinity Award from the International Center of Photography, the Lucy Award, the Medal of Honor from the University of Missouri and the title of Doctor Honoris Causa from the American University of Paris. He has also been awarded the medal of Chevalier in the French National Order of Merit.